Marilyn Monroe, John Wayne, Ingrid Bergman, Humphrey Bogart, Elvis Presley  a few of those innumerable Hollywood legends, whose visual characteristics Will Williams knows better, than they would even themselves. Because this internationally reknown artist had put their images with lively brushstrokes into famous motion picture posters. It comes as no surprise, to find the portfolio of »The Painter Of The Hollywood Court« as Williams is called, filled with nostalgic remembrances of the »good old movie world«. Movie posters of cinematic masterpieces like »Gentlemen Prefer Blondes«, »Mutiny On The Bounty« or »River Of No Return«. »Altogether during the last 50 years, I seem to have done around a thousand movie keyarts«, remembers the artist while in Germany on a visit. And on the occasion of the »Cultura Documenta« opening at the Kassel Central Station, Williams was asked to create a particular key-art, depicting Stan Laurel and Oliver Hardy. »Moviegoers responded during the 50 and 60es to painted artwork«, recalls the artist. During this period he had turned out under constant pressure, one after another of those colorful art-pieces for 20th Century Fox, RKO, Paramount, MGM and United Artists. No question, the adventurous life story of Will Williams lends itself for an exciting movie-script. Born in 1922 in Germany, he grew up in Wuppertal and went to the art-academy in Duesseldorf. Was drafted in 1942 by the Navy;  got into trouble for disobedience, wound up with a group of prominent comedian actors to entertain german soldiers in occupied Denmark. There he made contact with the danish resitance and with their help escaped to Sweden,  from where by way of England and North Africa, he finally makes it to Caserta/Italy. There, Williams becomes a member of the American 5th Army, OSS-Office Of Strategic Services to work for the propaganda section. As such he gets to Rome and is discharged two years later in 1946 from the OSS/SSU. Introduced by the movie-directors Rosselini and Fellini, he meets the »elite« of the italian motion-picture poster illustrators. »During a period of two years, I learned their color techniques«. And in 1948 did Will Williams his first own movie-poster for the John Ford Western »Three Goodfathers« (In Nome Di Dio). »I went through Rome, from one street to the other to look at my poster. All of a sudden, it was everywhere« says Williams. It was the beginning of his career. 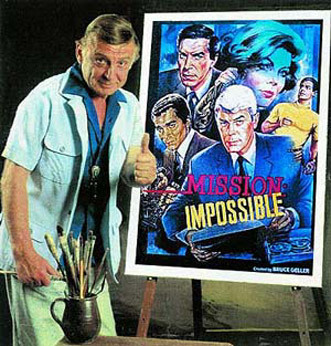 In 1950 he went back to Germany and quickly established himself as a specialist in action posters, which resulted in key-arts to movie classics like »Quo Vadis«, »Prince Valiant« and »The Robe«. Within a short time the artist had become prominent and was commissioned by all major motion picture companies. His big chances sees Williams in the USA and encouraged by the then 20th Century-Fox studio boss Spyros Scouras, he immigrates in 1959 to the States. 1960, Hollywood, California! He freelances for the Disney Studios, Fox, MGM and Columbia. Makes personal portraits for stars like Barbara Stanwyck, Clint Eastwood and John Wayne. He meets western director John Ford and becomes Fords exclusive illustrator to create the famous portfolio entitled »The John Fords Cowboy Kings Series«, depicting the great Western Stars of the american movies. WILL WILLIAMS was nominated art director of the upcoming »Secret Service Museum« in Washington DC. The initiative for which the US Government had given the »go ahead sign«.